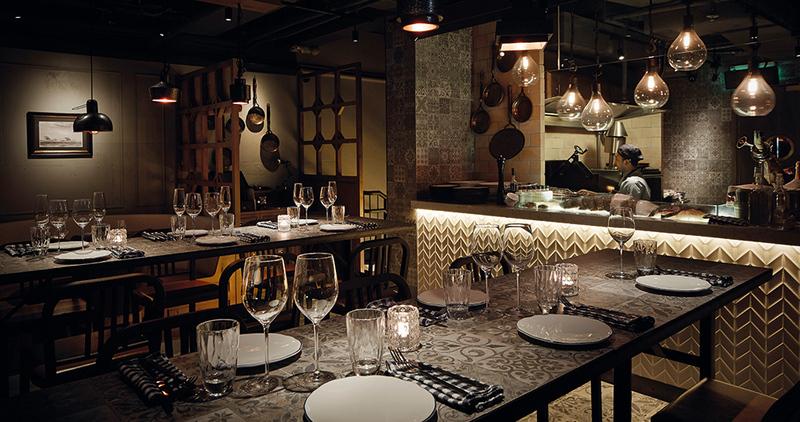 PORCELANOSA Grupo Projects: Spanish inspiration in The Optimist restaurant in Hong Kong (China). 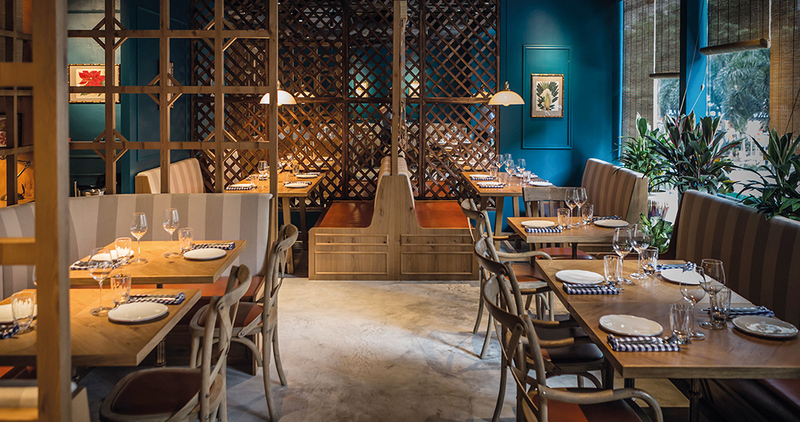 Spanish-inspired dishes and materials from the PORCELANOSA Grupo reach the bustling and lively Hennessy Road in Hong Kong, and they do so because of a new restaurant: The Optimist. Carried out by the designer, Rocío Martínez Amoedo, it stands out because of an interior design full of textures, geometry, and chiaroscuro. 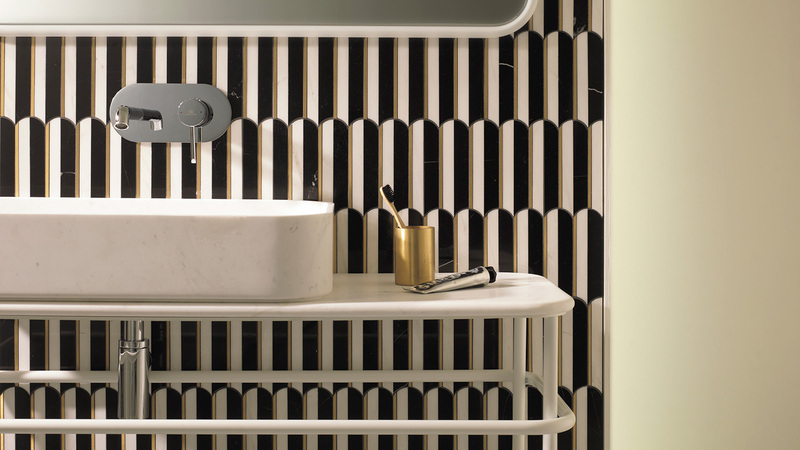 Spanish design has been positioned at the forefront in the world of design for years now, specifically in China, through gastronomy and interior design in individual projects with a strong character which are not influenced by fads or short-lived trends. The Optimist is one of these projects with a taste of Spain and a clear culinary message: savour the food, enjoy the space, and experience the joy of living and positive thinking when interacting and building relationships with others. A personality which is portrayed in every element in this gastronomical space and also in its interior architecture. In the design of the restaurant space one can find an important point that really makes the atmosphere: the light. A dim light, finished off with supports like lattices, which provide some mystery, a point of connection with the traditional eastern chiaroscuro, together with the ceramic reliefs that are all over the decoration. Going through every part of the space, one can find an exterior hall covered by two ceramic materials which also play a major role in the interior and which are framed by some big flowerpots with tropical plants. The large windows, designed to increase the flow of natural light, complete an iron façade lacquered in the same deep green as the tiles in the hall. 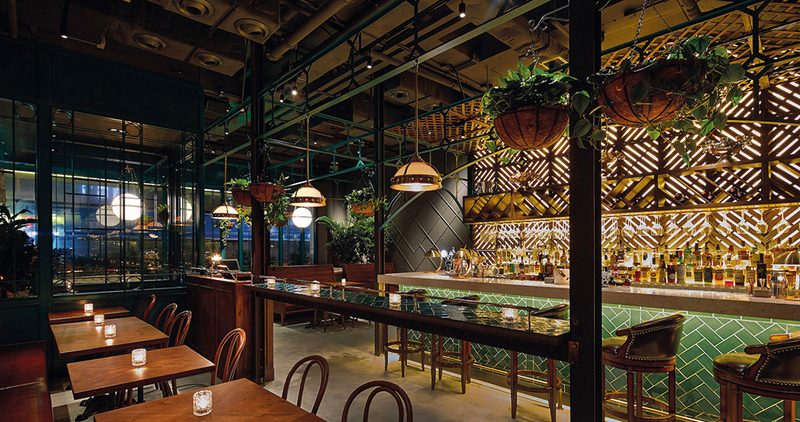 With regard to the bar, arches and pergolas made of iron combine with the dominator of the space: a bright green wall tile in a herringbone pattern in the front. When entering the dining room on the first floor, green again shows its character, by finding balance in combination with the warm oakwood lattice and the golden bamboo blinds which divide the wide space. 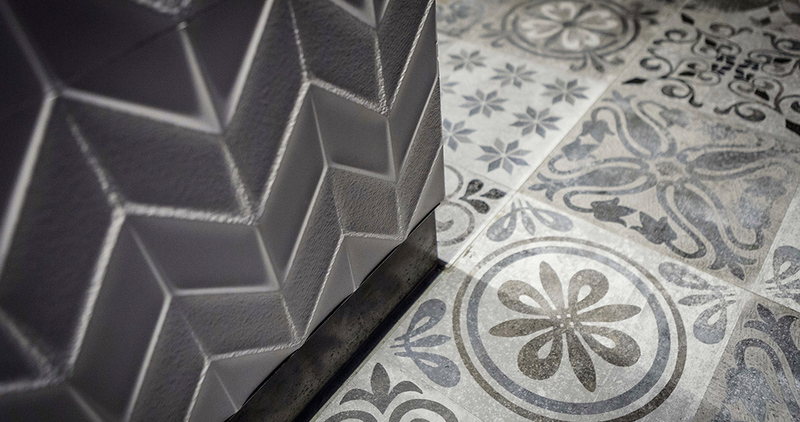 Botanical and naturalist decorative elements decorate the walls and the polished cement floor. On the second floor, the stone-effect in grey and the deep blue of the walls stand out, reminding us of the sea and all its secrets. The paint applied without pre-treatment shows the flaws and the character of the texture of the original walls which contrast with the delicate kitchen coverings. In the private area and the bar area, the objective is to enhance the contrasts between the different textures and the combination of the materials used. Ranging from the mud bricks baked in a masonry oven and the brass metals enveloping the smoke extractor and the delicate pictures of the hydraulic-inspired floor tiles for both the flooring and coverings around the kitchen, namely Antique Silver and Dover Spiga Caliza from Porcelanosa. Respect, authenticity, honesty and simplicity, all together in a market kitchen with the seasonal goods. 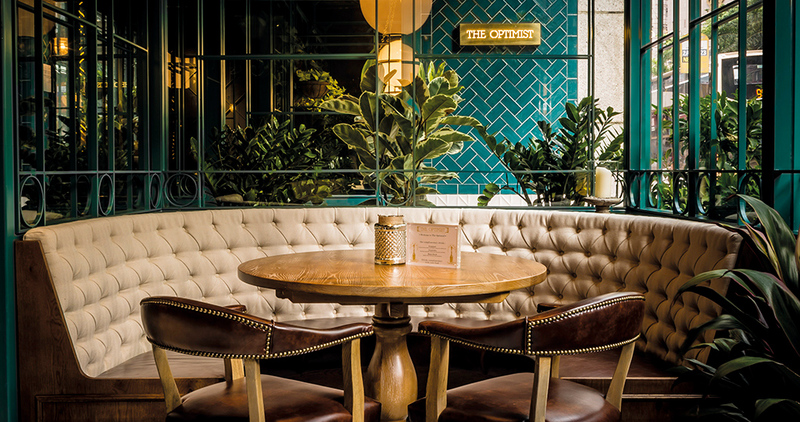 This is how the founding partners, Christian Talpo and Manuel Palacio, define The Optimist after the experience of their previous project in Hong Kong, the Italian restaurant called El Pirata. Its designer, Rocío Martínez, has been giving projects personality and character all over Asia since 2014, after a long career in London and Spain. After having watched her work in The Optimist, she defines the atmosphere created like so: ‘In The Optimist, it is where reality and legends come together in order to create a timeless, dreamlike space, full of references to the Spanish origin of the character who has named it. The stories of their adventures turn out to be the genesis of the concept which has defined the space and atmosphere of a unique location in a city like Hong Kong, where the light and the large interior heights are scarce, and where the space amplitude is a real luxury’.